Archchancellor (of Unseen University) Mustrum Ridcully: So… how are things in the godbothering business? Chief Priest of Blind Io: We do our humble best. How is the dangerous meddling with things man was not meant to understand? Ridcully: Pretty fair. Pretty fair. This entry was posted in Uncategorized on June 30, 2006 by oook. Thanks to Netflix and my own taste for the epic, I’m now entangled in Heimat II (more here). The first 11 episodes of Heimat I were certainly engrossing, but the second series is even more so because the characters are of my own age cohort. The events are mostly in Munich in the early 1960s, but they’re close enough to early 1960s Cambridge to give me a lot to think about. I’ve just watched the episode set on 22 November 1963, the day Kennedy was shot, and I was transported back to my own vivid memories of the day. Yesterday I sprang for the 20-odd VHS tapes for both series (used, via Amazon), and today I found (via the Wikipedia page) pointers to Heimat script (German language) and The Second Heimat script (German language). This is sufficient inducement for me to attempt to retrieve/extend my college German (last seen disappearing in the rear view mirror 45 years [and several languages] ago). This entry was posted in Uncategorized on June 29, 2006 by oook. His experiment in Flickr thumbnailing (http://flickr.trulyamazing.de/) is really a wonder. I’m leeching on his server’s bandwidth to run these two, so it’s with apologies that I link to my Flickr stuff and my images tagged ‘nsfaces’. I certainly see things in both that I wouldn’t otherwise have noticed. This entry was posted in images on June 28, 2006 by oook. 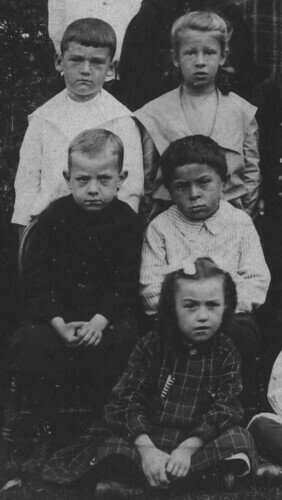 First grade class 1905, detail, originally uploaded by oook. I’m experimenting with blogging from Flickr, something I should have tried long ago. This one suggests the profound challenges faced by educators everywhere, and is just one of a vast number of images I’m trying to figure out what to do with. nsfaces.schtuff.com is my main silo, but I’m also beginning to build a collection of my own photographic past at oook.schtuff.com. This entry was posted in Uncategorized on June 28, 2006 by oook. 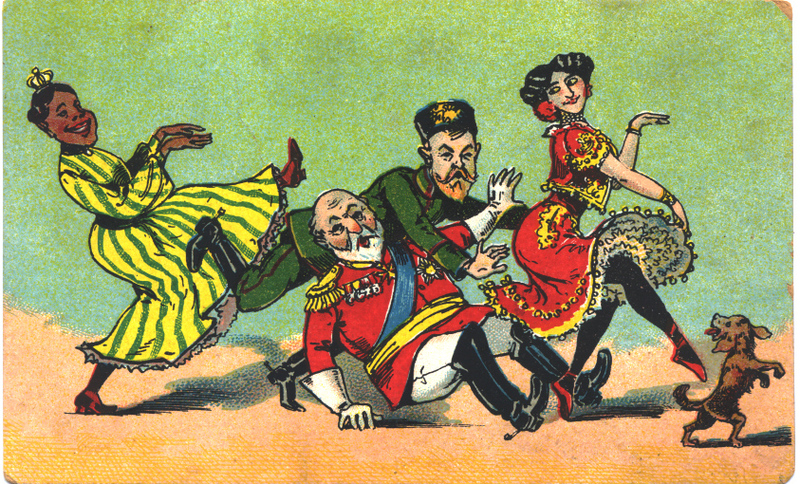 The two stumbling gentlemen would seem to be King Edward VII and Czar Nicholas. The ladies might represent Brazil (if color is the relevant attribute) and Spain, but I know of no early 20th century diplomatic crisis that involved those four nations. Any ideas? This entry was posted in Uncategorized on June 26, 2006 by oook. This InfoWorld article by James R. Borck is well worth a read for the techie contingent in RFID middle-management, but I find it chiefly remarkable for the startling beauty of its jargon. The RFID biz has plenty of rough patches ahead on its road to commercial ubitopia, but its geeks are shedding the initial hype and ballyhoo and generating a kind of poetry. This entry was posted in Uncategorized on June 24, 2006 by oook. This entry was posted in Uncategorized on June 21, 2006 by oook. This entry was posted in Uncategorized on June 7, 2006 by oook. This entry was posted in Uncategorized on June 5, 2006 by oook.